Single incision laparoscopic surgery (SILS) for cholecystectomy was introduced into our hospital in February 2011, with the goal of using the conventional technique but reducing surgical time. A 2-mm diameter forceps was also used in the right flank to achieve this objective. Our hospital policy includes a “Final Critical View of Safety” approach in cholecystectomy, in which flow of the cystic duct and artery into the gallbladder after dissection from the liver is confirmed prior to complete separation of the organs. This approach is used to avoid misidentification of the common bile duct and the hepatic artery and resulting damage to these organs. 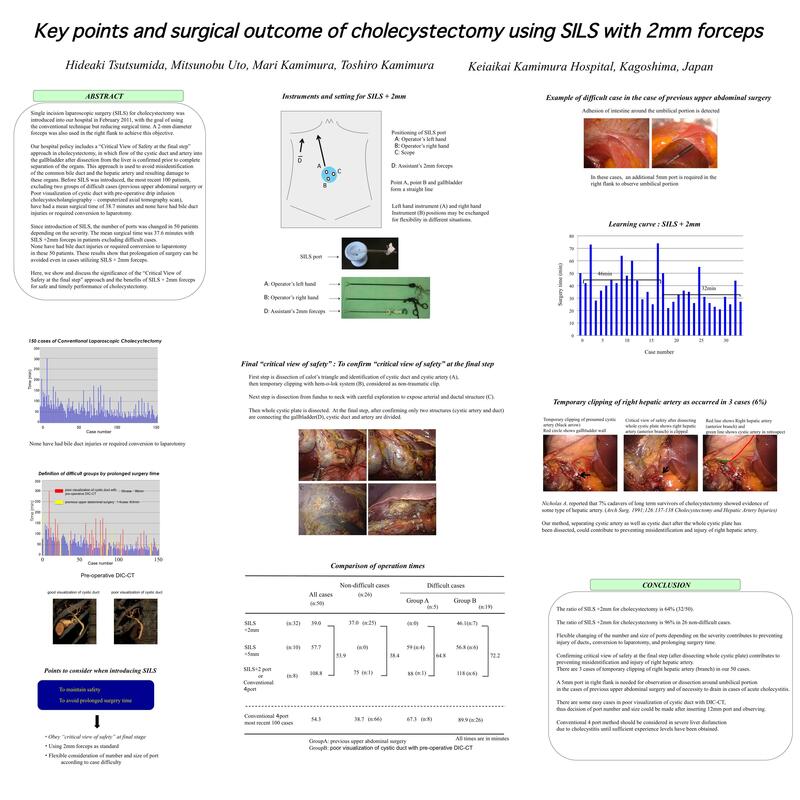 Before SILS was introduced, latest 50 patients, except two groups of difficult cases (previous upper abdominal surgery or poor visualization of cystic duct with pre-operative drip infusion cholecystocholangiography – computerized axial tomography scan), have had a mean surgical time of 39 minutes and none have had bile duct injuries or required conversion to laparotomy. Since introduction of SILS, the number of ports was changed in 30 patients depending on the severity. The mean surgical time was 40 minutes in patients except difficult cases and performed with SILS +2mm forceps. None have had bile duct injuries or required conversion to laparotomy in all patients. These results show that prolongation of surgery can be avoided even in procedure of SILS + 2mm forceps. Here, we show and discuss the significance of the "Final Critical View of Safety" approach and the benefits of SILS + 2mm forceps for safe and timely performance of cholecystectomy.